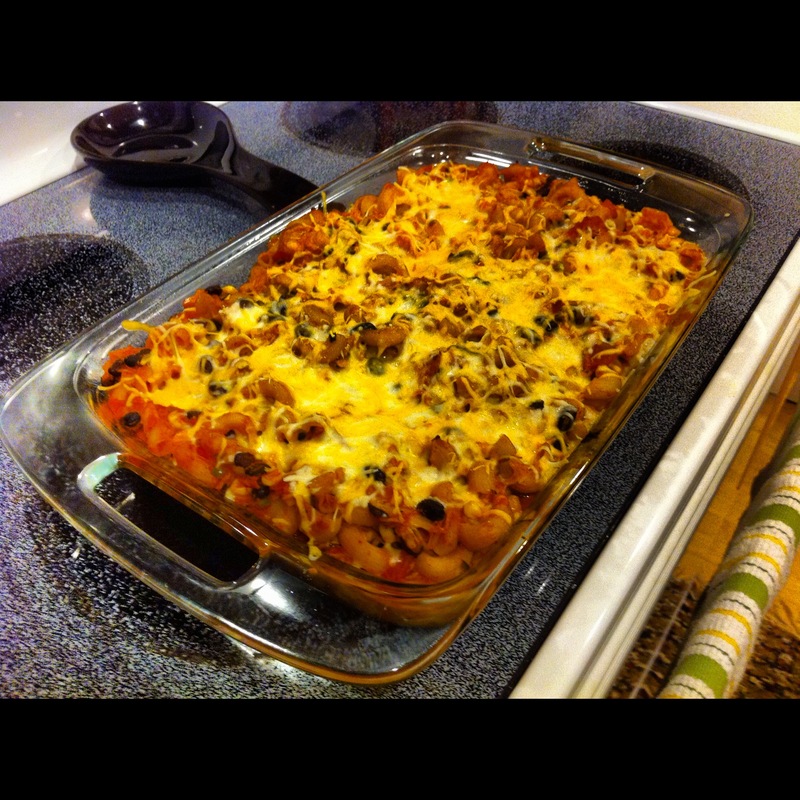 Chicken and Black Bean Casserole – Go Blondie! Tonight for our Sunday supper Carl wanted something with chicken, I searched on Tasty Kitchen and found a Chicken and Black Bean Casserole. 2 cups Uncooked Pasta (I Use Small Shapes) I used my gluten free brand that I like. I was trying to be a little creative and I added some frozen corn, which was good. Carl said he thought it was taste good with a little bit of crunch to it like crumbled fritos or tortilla chips on the top. 1. Preheat oven to 375ºF. Lightly grease a 9×13 pan, set aside. Cook pasta according to package directions. 2. Heat olive oil in a large pot (big enough to fit all of this in there eventually) over medium high heat. Add jalapeno and cook about 2 minutes. Add in diced tomatoes, chicken, black beans, tomato paste and water. Season with salt. Cook about 5 minutes. Stir in cooked pasta and 1 cup of the shredded cheese until everything is well blended (think about it like this, “I want a little bit of everything in every bite”). Pour into the prepared 9×13 pan. 3. Bake uncovered for 15 minutes. Remove pan from oven, top with remaining 1 1/2 cups shredded cheese. Bake an additional 5-10 minutes or until cheese is bubbly. We had added salsa, sour cream, hot sauce for toppings. So what is the brand name of your favorite pasta? I like the gluten free pasta brand Tinkyada. The website is in a past post if you scroll back. Yeah, I’m keeping an eye on the weather.